My fraternity in college would frequent the local bars and it always seemed like it would be something fun to do, and still yet make money. Snapping fingers and yelling. Bartenders definitely see everyone and we keep mental notes of who is next. So…I appreciate those who are more patient. What is the most “clever” line anyone has used on you to get a FREE drink? What is the best or worst pickup line you have overheard at your bar? Best: Excuse me, you owe me a drink…..Because when I looked at you, I dropped mine. Worst: I don’t have a library card, but do you mind if I check you out? If you could sit down and have a drink with anyone in the world, past or present, who would it be? MILA KUNIS! Because before she made it into fame, she was just a regular bartender! I’m sure we have a lot in common and it doesn’t hurt that she’s easy on the eyes! 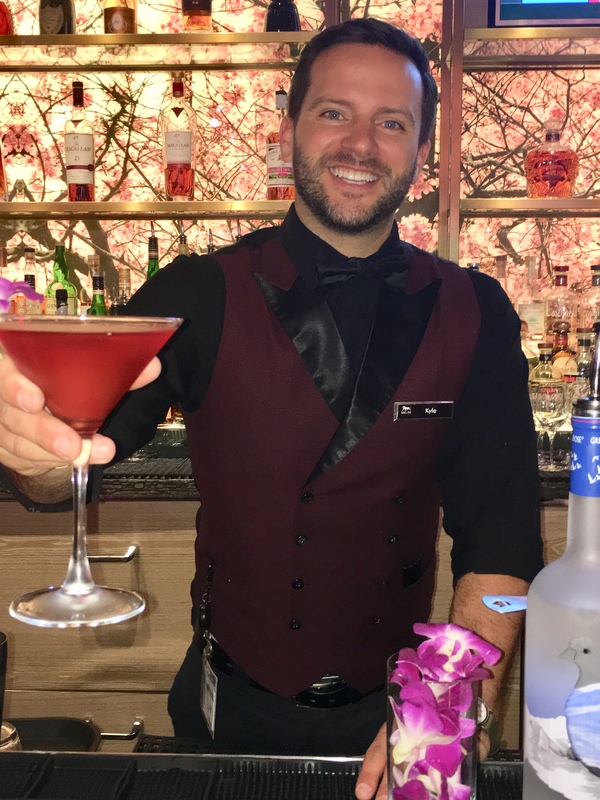 Kyle is behind Blossom bar from 1 – 9 pm most days of the week. Be sure to treat yourself to a couple hands of video poker while you are at the bar! If you would like to see your favorite bartender featured in this space, send contact information to office@oldtowncrier.com.